27.03.11 22:31:13 [0x0-0x1d08d07].com.adobe.Lightroom3 Notice 2011-03-27 22:31:13.353 Adobe Help[51959:903] NSDocumentController Info.plist warning: The values of CFBundleTypeRole entries must be 'Editor', 'Viewer', 'None', or 'Shell'. 27.03.11 22:37:44 Adobe Lightroom 3 Warning Oops! An untagged string (? :0: attempt to index field 'albumInfo' (a boolean value)) got thrown far enough that we display it to the user. This shouldn't happen. 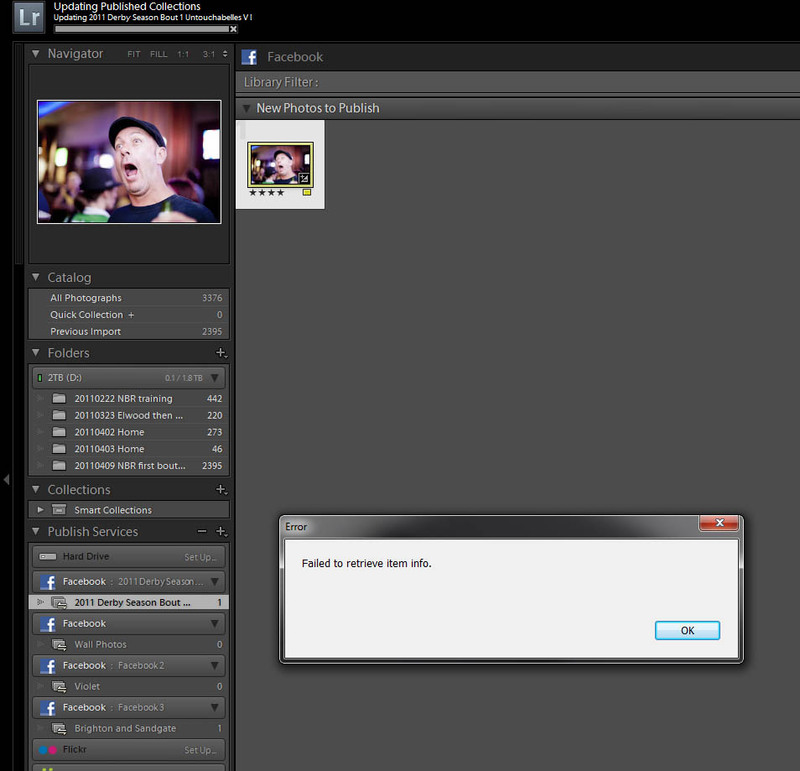 27.03.11 23:23:25 Adobe Lightroom 3 Warning Could not get album info from Facebook. 27.03.11 23:24:10 Adobe Lightroom 3 Warning Oops! An untagged string (? :0: attempt to index field 'albumInfo' (a boolean value)) got thrown far enough that we display it to the user. This shouldn't happen. I think this is happening because you're not currently authorized on Facebook. Try this: right-click on your Facebook publish service, choose Edit Settings, and look at the "Facebook Account" section to make sure you're authorized. We've added better error handling to the next dot release version to catch this. nope, I am authorized. I can send screenshots if you want. I think authorization also fails if you have a Facebook business account. You might try the 3.4 release candidate at http://labs.adobe.com/downloads/light..., although if it's not the authorization issue, I'm not confident we've hit your case. Does the album that you're trying to publish to still exist on Facebook? Julie, was your last post aimed at MetaWop? I mentioned Facebook business account because that's the only one I have made for testing. I know others have managed to authorize accounts so assumed they were using personal accounts. I am also UK-based and that may be an issue too (you never know!). However, I had no problems authorizing my Flickr account. Yes, sorry, that was a question for MetaWop. By the way, Shangara, the 3.4 RC now takes advantage of Facebook's new API for posting to business accounts. Thanks, Julie, that sounds good. I know that there are bug fixes that have been made to 3.4 since they posted the 3.4 release candidate (based on feedback from that build posting) - so she may be referencing that. I'll let Julie clarify. Just to let you know: I'm in the process of reproducing the problem. Currently, I'm getting other/new problems with publishing a collection to Facebook. let me sort it out & I'll post details soon here. MetaWops, can I contact you offline? "Failed to retrieve item info" in two separate pop up windows. Every time I try to upload a batch to Facebook it sends the first file to the right gallery just fine but then throws that error and fails to proceed to the next file. I am not keen on the notion of uploading most of a 2000+ image gallery set file by painful file before deadline. Let us know if you're still experiencing issues after this release.